Fantstic Fun Friday and Fabulicous Freebies! Can you tell I am in alliteration mode? I feel that I have been speaking in Figurative Language for weeks now!! We just finished up our Figurative Language Unit with an assessment today, and let me tell you, I LOVE Fig. Lang., but I am plum tuckered out from it all! On a positive note though, my kiddos LOVED FigLang. They had an absolute BLAST with all of our activities and making up their own funny and fun FigLang! I think their favorites were Hyperbole and Idioms. They loved that they got to exaggerate for fun in school and make up silly things that weren't taking literally! The best part, they TOTALLY UNDERSTOOD IT!!!!!!! Now that is what I'm talking about. Of my 56 kids, only ONE, I repeat, ONE got lower than a 2 on the assesment! 80% of my kiddos got 3's!! (We do a 3, 2, 1, grading scale.) I was one proud teacher when I was grading them! 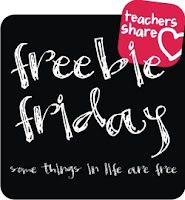 Now I plan on putting together an entire Figurative Language pack for TPT of ALL of the activities I use to teach this, but in the meantime, I thought I'd link up with Teaching Blog Addict's Friday Freebie link! You can click here to download a bunch of Figurative Language activites I use in my classroom. My favorite and my kiddos favorite of these is the FigLang in songs. They loved listening to the music and trying to find all the examples! They were coming up to me for days and telling me about songs they heard with examples of FigLang! 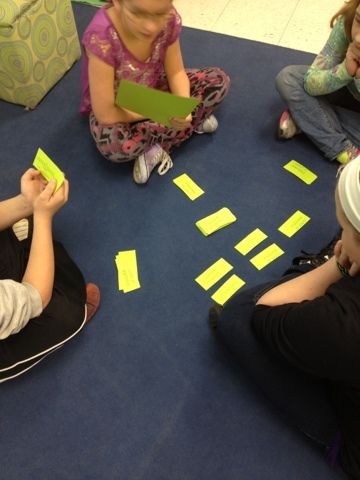 They also loved the Figurative Language card game we played! Included in this pack is also an "Alluring Alliteration activity" using letter tiles, a Figurative Language Hunt you can use for any book, and a quick assessment! Another one of their favorite things was to listen to silly poems and pick out FigLang. 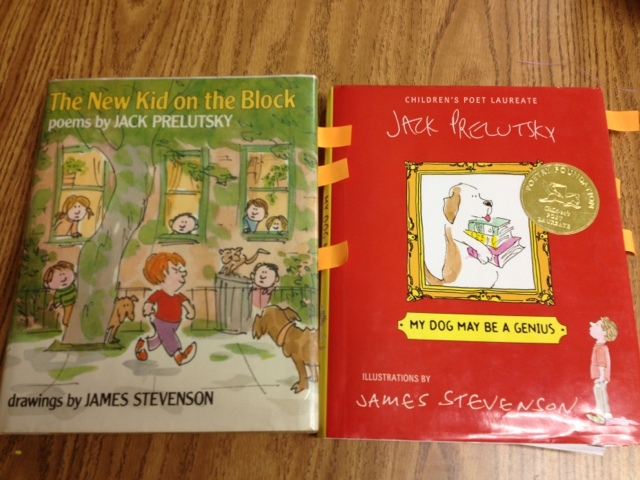 I used two of my fav poem books for this, and let the kids choral and echo read them during buddy reading this week. They loved it! Here's a few pictures of what we were doing. I also saw this linky party and couldn't resist. One of my favorite things about blogging is the wonderful advice you get from other teachers and examples you see of teaching! 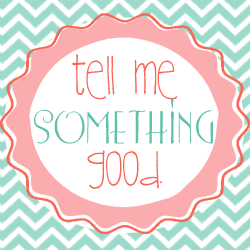 It's such a warm and fuzzy place :) So I'm linking up with Rowdy in First Grade for her tell me something good linky!! Something good from school: The staff I work with, ROCKS!! We just have so much fun together, it should be illegal. Like seriously. Throughout college and my first years of teaching I have been in many schools, and the dynamic of these teachers is THE BEST. We all got each others back's, and everyone collaborates, shares, and loves! Seriously.. I'M LUCKY! Something good from home: We started booking our summer trip out to Las Vegas!!! I cannot wait!! I have never been to Vegas and I've always wanted to go! Hubs and I decided there's no better time than now. We are going with MIL and FIL, as well as sissy in law and her boy, and brother in law. Did I mention I was excited?!?! We're going to spend 4 days/nights on the strip, 3 days/nights out at a resort just outside of Vegas, and 2 days at Sequoia National Park.. so fun! Hi Catherine! Thanks so much for stopping in :) I'm glad you enjoyed the freebies! Have you been able to use them in your classroom yet? I love to hear from other teachers how they worked! Hi Brandi! 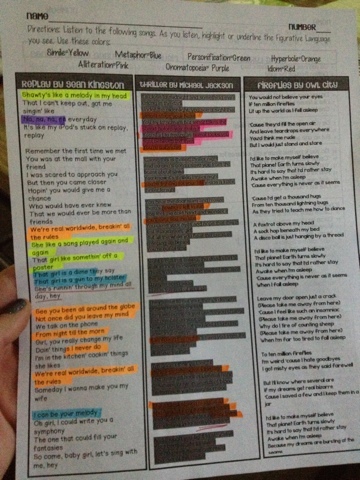 I love finding other upper elementary teachers on here :) The song lyrics worked GREAT with my kiddos. They seriously loved this activity! I hope you were able to use it with your kiddos. Your blog is awesome! I can't wait to get home and rest a few minutes and then read more! I do love working on figurative language in my classroom as well. We are currently learning about oxymorons. I also ordered a new teaching book last week that is supposed to suggest books to use with writing in the classroom. I'll let you know if it is a good one! 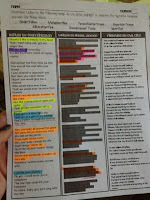 Please check my blog as well: http://teachersareterrific.blogspot.com/ THANKS! Thanks for following and reading!